GlaxoSmithKline (GSK) has received approval from the US Food and Drug Administration (FDA) for the first adjuvanted vaccine to prevent H5N1 influenza, also known as bird flu. The FDA cleared the pandemic Influenza A (H5N1) virus monovalent vaccine, adjuvanted (also referred to as Q-Pan H5N1 influenza vaccine), for use in people aged 18 and older who are at increased risk of exposure to the virus. The vaccine is composed of monovalent, inactivated, split A/H5N1 influenza virus antigen and GSK’s AS03 adjuvant. The company said that in clinical studies, the adjuvanted formulation stimulated the required immune response while using a smaller amount of antigen as compared with a formulation without adjuvant. November 22, 2013 — The U.S. Food and Drug Administration approved Olysio (simeprevir), a new therapy to treat chronic hepatitis C virus infection. Hepatitis C virus (HCV) infections affect approximately 3 percent of the worldwide population and often lead to cirrhosis and hepatocellular carcinoma. The standard therapy of pegylated- interferon and ribavirin induces serious side effects and provides viral eradication in less than 50% of patients. Combination therapy of HCV including ribavirin and interferonare currently is the approved therapy for HCV. Unfortunately, such combination therapy also produces side effects and is often poorly tolerated, resulting in major clinical challenges in a significant proportion of patients. Numerous direct acting agents (DAAs) have been or are being developed for treatment of HCV, such as telaprevir and boceprevir (both received MA approved in 2011 for use with interferon and ribavirin based therapy), however direct acting agents are linked to increased toxicity of treatment, the emergence of resistance, and to date do not provide a standard of care which is interferon free. The combination of direct acting agents can also result in drug-drug interactions. To date, no HCV therapy has been approved which is interferon free. There is therefore a need for new combination therapies which have reduced side effects, and interferon free, have a reduced emergence of resistance, reduced treatment periods and/or and enhanced cure rates. Simeprevir (formerly TMC435) is an experimental drug candidate for the treatment of hepatitis C. It is being developed byMedivir and Johnson & Johnson‘s pharmaceutical division Janssen Pharmaceutica and is currently in Phase III clinical trials. Simeprevir has been launched in 2013 in Japan by Janssen Pharmaceutical (JP) for use in combination with pegylated interferon (Peg-IFN) and ribavirin for the treatment of genotype 1 chronic hepatitis C virus (HCV) patients who are treatment naïve, prior non responders or relapsed following treatment with Peg-IFN with or without ribavirin. In 2013, the product has also been approved in the U.S. by Medivir and Janssen R&D Ireland for the oral treatment of chronic hepatitis C genotype 1 infection, in combination with peginterferon alfa and ribavirin in adults with compensated liver disease, including cirrhosis, who are treatment-naïve or who have failed previous interferon therapy (pegylated or non-pegylated) with ribavirin. The drug candidate was originally developed at Medivir, which was acquired by Janssen R&D Ireland in 2012. In November 2004, Medivir entered into a license and research collaboration agreement with Tibotec, a Johnson & Johnson subsidiary, for the discovery and development of orally active protease inhibitors of the NS3/4A protease of HCV. In 2011, a codevelopment agreement between Pharmasset (now Gilead Sciences) and Tibotec was signed for the treatment of chronic hepatitis C (HCV) in combination with PSI-7977. Also in 2011, fast track designation was received in the U.S. for the treatment of chronic hepatitis C (CHC) genotype-1 infection. In 2011, Tibotec Therapeutics, Division of Centocor Ortho Biotech Products, L.P. announced that it had changed its name to Janssen Therapeutics, Division of Janssen Products, LP. Hepatitis C virus (HCV) is the leading cause of chronic liver disease worldwide. Following initial acute infection, a majority of infected individuals develop chronic hepatitis because HCV replicates preferentially in hepatocytes but is not directly cytopathic. Chronic hepatitis can progress to liver fibrosis leading to cirrhosis, end- stage liver disease, and HCC (hepatocellular carcinoma), making it the leading cause of liver transplantations. This and the number of patients involved, has made HCV the focus of considerable medical research. Replication of the genome of HCV is mediated by a number of enzymes, amongst which is HCV NS3 serine protease and its associated cofactor, NS4A. NS3 serine protease is considered to be essential for viral replication and has become an attractive target for drug discovery. Current anti-HCV therapy is based on (pegylated) interferon-alpha (IFN-α) in combination with ribavirin. Not only does this therapy result in a limited efficacy in that only part of the patients are treated successfully, but it also faces significant side effects and is poorly tolerated in many patients. Hence there is a need for further HCV inhibitors that overcome the disadvantages of current HCV therapy such as side effects, limited efficacy, poor tolerance, the emergence of resistance, as well as compliance failures. 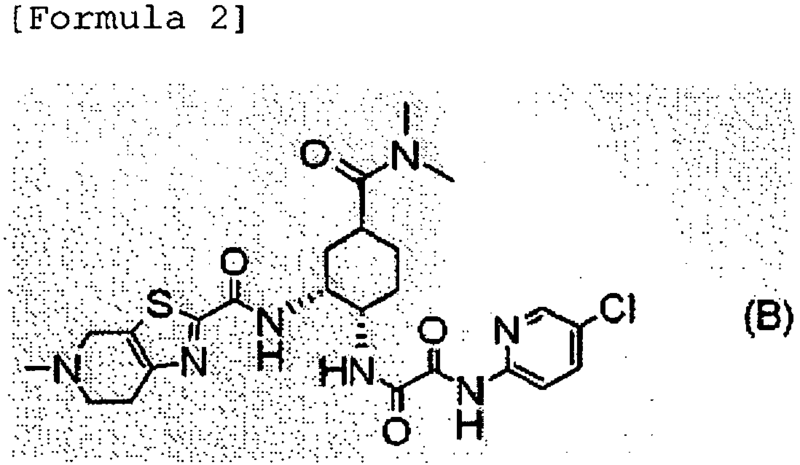 The compound of formula (I) is an inhibitor of the Hepatitis C virus (HCV) serine protease and is described in WO 2007/014926, published on 8 February 2007. 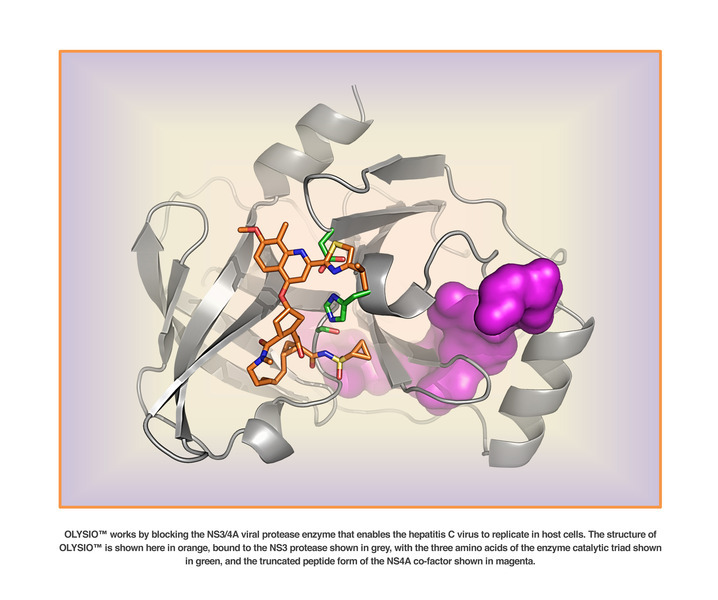 This compound overcomes several of the disadvantages of current anti-HCV therapy and in particular shows pronounced activity against HCV, has an attractive pharmacokinetic profile, and is well-tolerated. Following the synthesis procedure described in Example 5 of WO 2007/014926, an amorphous solid form is obtained. It now has been found that the compound of formula (I) can be converted into crystalline forms, which can advantageously be used as active ingredients in anti-HCV therapy. To that purpose, these crystalline forms are converted into pharmaceutical formulations. OLYSIO (simeprevir) is an inhibitor of the HCV NS3/4A protease. Simeprevir drug substance is a white to almost white powder. Simeprevir is practically insoluble in water over a wide pH range. It is practically insoluble in propylene glycol, very slightly soluble in ethanol, and slightly soluble inacetone. It is soluble in dichloromethane and freely soluble in some organic solvents (e.g., tetrahydrofuran and N,N-dimethylformamide). OLYSIO (simeprevir) for oral administration is available as 150 mg strength hard gelatin capsules. Each capsule contains 154.4 mg of simeprevir sodium salt, which is equivalent to 150 mg of simeprevir. OLYSIO (simeprevir) capsules contain the following inactive ingredients: colloidal anhydrous silica, croscarmellose sodium, lactose monohydrate, magnesium stearate and sodium lauryl sulphate. The white capsule contains gelatin and titanium dioxide (E171) and is printed with ink containing iron oxide black (E172) and shellac (E904). Triethylamine (42.4 mL, 302 mmol) was added to a suspension of 3-methoxy-2- methylbenzoic acid (45.6 g, 274 mmol) in dry toluene (800 mL). A clear solution was obtained. 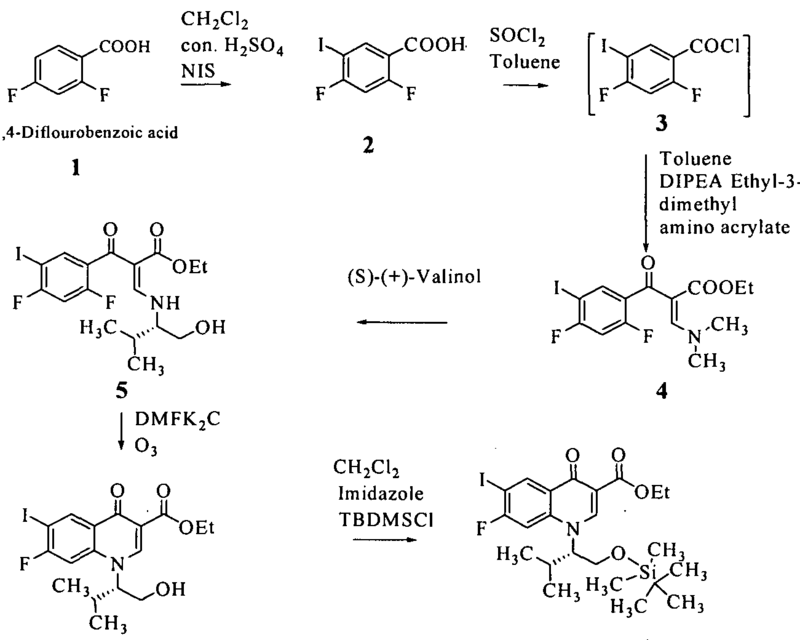 Then, dppa (65.4 mL, 302 mmol) in toluene (100 mL) was slowly added. After 1 h at room temperature, the reaction mixture was successively heated at 500C for 0.5 h, at 700C for 0.5 h then at 1000C for 1 h. To this solution, t-BuOH (30.5 g, 411 mmol) in toluene (40 mL) was added at 1000C and the resulting mixture was refluxed for 7h. The solution was cooled to room temperature then successively washed with water, 0.5 N HCl, 0.5 N NaOH and brine, dried (Na2SO4), and evaporated to give 67 g of the target product: m/z = 237 (M)+. TFA (40.7 mL, 548 mmol) was added to a solution of jV-(teτt-butyloxycarbonyl)- 3-methoxy-2-methylaniline, in dichloro methane (500 mL). After 2 h at room temperature, TFA (40.7 mL, 548 mmol) was added and the resulting mixture was stirred at room temperature overnight. Then, volatiles were evaporated. The residue was triturated with toluene (100 mL) and diisopropylether (250 mL), filtered off and washed with diisopropyl ether (100 mL) to give 56.3 g of the title product as a TFA salt: m/z = 138 (M+H)+. The TFA salt was transformed to the free aniline by treatment with NaHCO3. A solution Of BCl3 (1.0 M, 200 mL, 200 mmol) in CH2Cl2 was slowly added under nitrogen to a solution of 3-methoxy-2-methylaniline (26.0 g, 190 mmol) in xylene (400 mL). The temperature was monitored during the addition and was kept below 100C. The reaction mixture was stirred at 5°C for 0.5 h. Then, dry acetonitrile (13 mL, 246 mmol) was added at 5°C. After 0.5 h at 5°C, the solution was transferred into a dropping funnel and slowly added at 5°C to a suspension OfAlCl3 (26.7 g, 200 mmol) in CH2Cl2 (150 mL). After 45 min at 5°C, the reaction mixture was heated at 700C under a nitrogen stream. After evaporation Of CH2Cl2, the temperature of the reaction mixture reached 65°C. After 12 h at 65°C, the reaction mixture was cooled at 00C, poured onto ice (300 g), and slowly heated to reflux for 7h. After 2 days at room temperature, 6 N NaOH (50 mL) was added. The pH of the resulting solution was 2-3. The xylene layer was decanted. The organic layer was extracted with CH2Cl2. The xylene and CH2Cl2 layers were combined, successively washed with water, IN NaOH, and brine, dried (Na2SO4) and evaporated. The residue was triturated in diisopropyl ether at O0C, filtered off and washed with diisopropylether to give 13.6 g (40 %) of the title product as a yellowish solid: m/z = 180 (M+H)+. A solution of the compound 4 (18.6 g, 104 mmol) in dioxane (50 rnL) was added under nitrogen to a suspension of 4-isopropylthiazole-2-carbonyl chloride in dioxane (250 rnL). After 2 h at room temperature, the reaction mixture was concentrated to dryness. Then, the residue was partitioned between an aqueous solution of NaHCOs and AcOEt, organic layer was washed with brine, dried (Na2SO4), and evaporated. The residue was triturated in diisopropyl ether, filtered off and washed with diisopropyl ether to give 30.8 g (90 %) of the title product 5. Potassium tert-butoxide (21.8 g, 195 mmol) was added to a suspension of the compound 5 (30.8 g, 92.7 mmol) in tert-butanol. The resulting reaction mixtures was heated at 1000C overnight. Then, the reaction mixture was cooled at room temperature and diluted with ether (100 mL). The precipitate was filtered off and washed with Et2O to give a powder (fraction A). The mother liquor was concentrated in vacuo, triturated in ether, filtered off, and washed with ether to give a powder (fraction 2). Fractions 1 and 2 were mixed and poured into water (250 mL). The pH of the resulting solution was adjusted to 6-7 (control with pH paper) with HCl IN. The precipitate was filtered off, washed with water and dried. Then, the solid was triturated in diisopropyl ether, fϊltered off and dried to give 26 g (88%) of the compound 6 as a brownish solid: m/z = 315 (M+H)+. (25 mL) was added dropwise and the mixture was heated to 700C for 12 hours. The reaction mixture was poured on water (200 mL) and extracted with ether (4 x 50 mL), dried (MgSO4), filtered and evaporated to give 35 g of the target product 7 as a yellowish oil which was used without further purification in the next step. 12 hours. Then, the reaction mixture was poured on water (100 mL) and extracted with ether (4 x 50 mL), dried (MgSO4), filtered and the ether was distilled under atmospheric pressure. The resulting oil was purified by distillation under vacuum (13 mm Hg pressure, 500C) to give 7,4 g (34 %) of the title product 8 as a colourless oil: 1H-NMR (CDCl3): δ 5.8 (m, IH), 5 (ddd, J = Yl 2 Hz, 3.5 Hz, 1.8 Hz, IH), 4.95 (m, IH), 2.5 (t, J = 7.0 Hz, 2H), 2.43 (s, 3H), 2.08 (q, J= 7.0 Hz, 2H), 1.4 (m, 4H), 1.3 (br s, IH). 3-Oxo-2-oxa-bicyclo[2.2.1]heptane-5-carboxylic acid 9 (500 mg, 3.2 mmol) in 4 mL DMF was added at 00C to HATU (1.34 g, 3.52 mmol) and JV-methylhex-5-enylamine (435 mg, 3.84 mmol) in DMF (3 mL), followed by DIPEA. After stirring for 40 min at 00C, the mixture was stirred at room temperature for 5 h. Then, the solvent was evaporated, the residue dissolved in EtOAc (70 rnL) and washed with saturated NaHCOs (IO mL). The aqueous layer was extracted with EtOAc (2 x 25 mL). The organic phases were combined, washed with saturated NaCl (20 mL), dried (Na2SO4), and evaporated. Purification by flash chromatography (EtO Ac/petroleum ether, 2:1) afforded 550 mg (68%) of the target product 10 as a colorless oil: m/z = 252 (M+H)+. A solution of LiOH (105 mg in 4 mlof water) was added at 00C to the lactone amide 10. After Ih, the conversion was completed (HPLC). The mixture was acidified to pH 2 – 3 with IN HCl, extracted with AcOEt, dried (MgSO4), evaporated, co-evaporated with toluene several times, and dried under high vacuum overnight to give 520 mg (88%) of the target product 11: m/z = 270 (M+H)+. 30.2 mmol). The mixture was cooled in an ice bath under argon, and then DMF (100 mL) and DIPEA (12.5 mL, 11.5 mmol) were successively added. After 30 min at 00C, the solution was stirred at room temperature for an additional 3 h. Then, the reaction mixture was partitioned between EtOAc and water, washed successively with 0.5 N HCl (20 mL) and saturated NaCl (2 x 20 mL), and dried (Na2SO4). Purification by flash chromatography (AcOEt/CH2Cl2/Petroleum ether, 1 :1 :1) afforded 7.41 g (60%) of the target product 13 as a colorless oil: m/z = 407 (M+H)+. DIAD (1.02 niL, 5.17 mmol) was added at -15°C under nitrogen atmosphere to a solution of 13 (1.5 g, 3.69 mmol), quinoline 6 (1.39 g, 4.43 mmol) and triphenyl- phosphine (1.26 g, 4.80 mmol) in dry THF (40 mL). After 4.5 h, at -15°C, the reaction mixture was partitioned between ice-cold water and AcOEt, dried (Na2SO4) and evaporated. The crude material was purified by flash column chromatography (gradient of petroleum AcOEt/CH2Cl2, 1 :9 to 2:8) to give 1.45 g (56 %) of the target product 14: m/z = 703 (M+H)+. (d, J= 9 Hz, IH), 7.48 (s, IH), 8.03 (d, J= 9 Hz, IH). 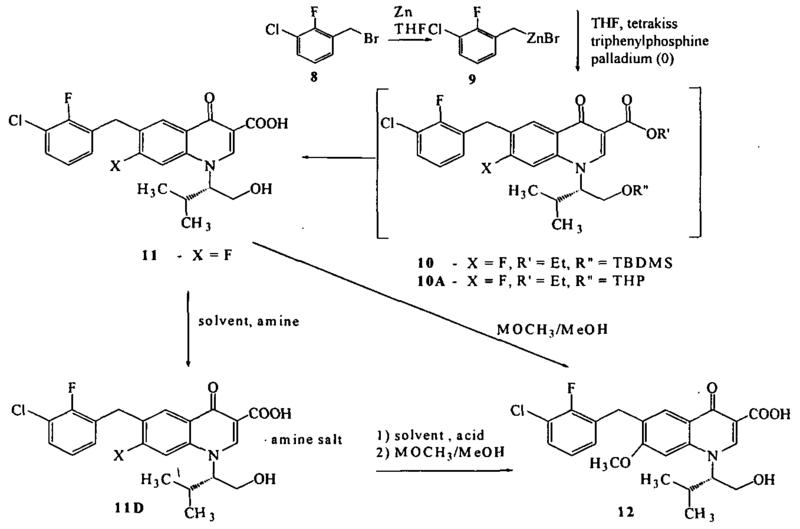 A solution of lithium hydroxide (1.65 g, 38.53 mmol) in water (15 rnL) was added to a stirred solution of ester 15 (620 mg, 0.920 mmol) in THF (30 mL) and MeOH (20 mL). After 16 h at room temperature, the reaction mixture was quenched with NH4Cl sat., concentrated under reduced pressure, acidified to pH 3 with HCl IN and extracted with CH2Cl2, dried (MgSO4) and evaporated to give 560 mg (88%) of carboxylic acid 16. m/z = 647 (M+H)+. 1H NMR (CDCl3): 1.11-1.40 (m, 8H), 1.42-1.57 (m, 2H), 1.74 (m, 2H), 1.88-2.00 (m, 2H), 2.13 (m, IH), 2.28 (m, IH), 2.40 (m, IH), 2.59 (m, 2H), 2.67 (s, 3H), 2.81 (m, IH), 2.97 (s, 3H), 3.19 (m, IH), 3.31 (m, IH), 3.71 (m, IH), 3.96 (s, 3H), 4.56 (dt, J= 4 Hz, 12 Hz, IH), 5.23 (m, 2H), 5.66 (m, IH), 7.01 (s, IH), 7.10 (s, IH), 7.22 (d, J= IO Hz, IH), 7.45 (s, IH), 8.00 (d, J= 10 Hz, IH). 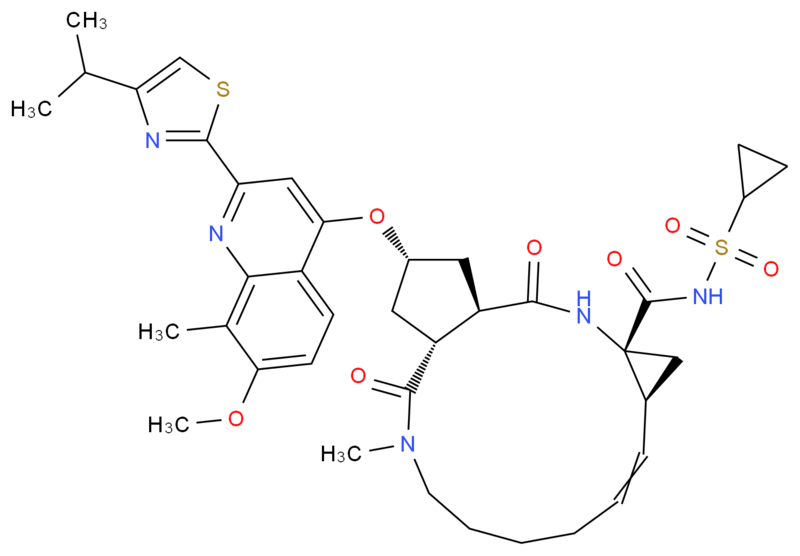 A solution of the compound 16 (560mg, 0.867 mmol) prepared according to Example 4, and carbonyldiimidazole (308 mg, 1.90 mmol) in dry THF (10 mL) was stirred at reflux under nitrogen for 2h. 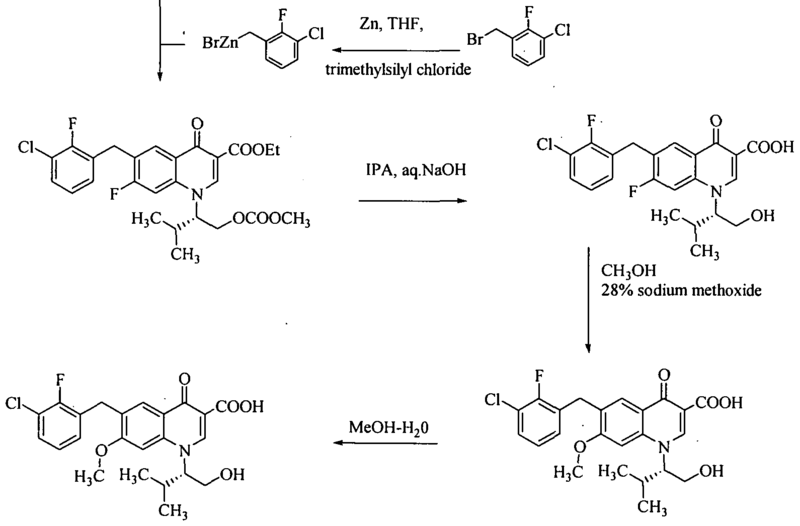 The reaction mixture was cooled to room temperature and cyclopropylsulfonamide (400 mg, 3.301 mmol) and DBU (286 mg, 1.881 mmol) were added. This solution was heated at 500C for 15 h. Then, the reaction mixture was cooled down at room temperature and concentrated under reduced pressure. The residue was partitioned between CH2Cl2 and HCl 1 N, the organic layer was washed with brine, dried (MgSO4) and evaporated. Purification by flash chromatography (gradient of EtOAc (0 to 25%) in CH2Cl2) afforded 314 mg of an off-white solid which was further washed with water, then isopropylether, and dried in the vacuum oven to deliver 282 mg (40%) of the pure title product 17, which is the compound of formula (I) SIMEPREVIR , as a white powder: m/z = 750 (M+H)+. 1H NMR (CDCl3): 0.99-1.52 (m, 14H), 1.64-2.05 (m, 4H), 2.77 (m, IH), 2.41 (m, 2H), 2.59 (m, 2H), 2.69 (s, 3H), 2.92 (m, 2H), 3.04 (s, 3H), 3.19 (m, IH), 3.40 (m, 2H), 3.98 (s, 3H), 4.60 (t, J= 13 Hz, IH), 5.04 (t, J= 11 Hz, IH), 5.37 (m, IH), 5.66 (m, IH), 6.21 (s, IH), 7.02 (s, IH), 7.22 (d, J= IO Hz, IH), 7.45 (s, IH), 7.99 (d, J= 10 Hz, IH), 10.82 (broad s, IH). Triethylamine (42.4 mL, 302 mmol) was added to a suspension of 3-methoxy-2- methylbenzoic acid (45.6 g, 274 mmol) in dry toluene (800 mL). A clear solution was obtained. Then, dppa (65.4 mL, 302 mmol) in toluene (100 mL) was slowly added. After 1 h at room temperature, the reaction mixture was successively heated at 50°C for 0.5 h, at 70°C for 0.5 h then at 100°C for 1 h. To this solution, t-BuOH (30.5 g, 411 mmol) in toluene (40 mL) was added at 100°C and the resulting mixture was refluxed for 7h. The solution was cooled to room temperature then successively washed with water, 0.5 N HCl, 0.5 N NaOH and brine, dried (Na2SO4), and evaporated to give 67 g of the target product: m/z = 237 (M)+. TFA (40.7 mL, 548 mmol) was added to a solution of iV-(tert-butyloxycarbonyl)-3- methoxy-2-methylaniline, in dichloromethane (500 mL). After 2 h at room temperature, TFA (40.7 mL, 548 mmol) was added and the resulting mixture was stirred at room temperature overnight. Then, volatiles were evaporated. The residue was triturated with toluene (100 mL) and diisopropylether (250 mL), filtered off and washed with diisopropyl ether (100 mL) to give 56.3 g of the title product as a TFA salt: m/z = 138 (M+H)+. The TFA salt was transformed to the free aniline by treatment with NaHCO3. A solution OfBCl3 (1.0 M, 200 mL, 200 mmol) in CH2Cl2 was slowly added under nitrogen to a solution of 3-methoxy-2-methylaniline (26.0 g, 190 mmol) in xylene (400 mL). The temperature was monitored during the addition and was kept below 10°C. The reaction mixture was stirred at 5°C for 0.5 h. Then, dry acetonitrile (13 mL, 246 mmol) was added at 5°C. After 0.5 h at 5°C, the solution was transferred into a dropping funnel and slowly added at 5°C to a suspension OfAlCl3 (26.7 g, 200 mmol) in CH2Cl2 (150 mL). After 45 min at 5°C, the reaction mixture was heated at 70°C under a nitrogen stream. After evaporation Of CH2Cl2, the temperature of the reaction mixture reached 65°C. After 12 h at 65°C, the reaction mixture was cooled at 0°C, poured onto ice (300 g), and slowly heated to reflux for 7h. After 2 days at room temperature, 6 N NaOH (50 mL) was added. The pH of the resulting solution was 2-3. The xylene layer was decanted. The organic layer was extracted with CH2Cl2. The xylene and CH2Cl2 layers were combined, successively washed with water, IN NaOH, and brine, dried (Na2SO4) and evaporated. The residue was triturated in diisopropyl ether at O0C, filtered off and washed with diisopropylether to give 13.6 g (40 %) of the title product as a yellowish solid: m/z = 180 (M+H)+. A solution of (2-amino-4-methoxy-3-methylphenyl)(methyl)ketone (18.6 g, 104 mmol) in dioxane (50 mL) was added under nitrogen to a suspension of 4-isopropylthiazole-2- carbonyl chloride in dioxane (250 mL). After 2 h at room temperature, the reaction mixture was concentrated to dryness. Then, the residue was partitioned between an aqueous solution OfNaHCO3and AcOEt, organic layer was washed with brine, dried (Na2SO4), and evaporated. The residue was triturated in diisopropyl ether, filtered off and washed with diisopropyl ether to give 30.8 g (90 %) of the title product 35. Potassium tert-butoxide (21.8 g, 195 mmol) was added to a suspension of 2′-[[(4-iso- propylthiazole-2-yl)(oxo)methyl]amino]-4′-methoxy-3′-methylacetophenone (35, 30.8 g, 92.7 mmol) in tert-butanol. The resulting reaction mixtures was heated at 100°C overnight. Then, the reaction mixture was cooled at room temperature and diluted with ether (100 mL). The precipitate was filtered off and washed with Et2O to give a powder (fraction A). The mother liquor was concentrated in vacuo, triturated in ether, filtered off, and washed with ether to give a powder (fraction 2). Fractions 1 and 2 were mixed and poured into water (250 mL). The pH of the resulting solution was adjusted to 6-7 (control with pH paper) with HCl IN. The precipitate was filtered off, washed with water and dried. Then, the solid was triturated in diisopropyl ether, filtered off and dried to give 26 g (88%) of the title product 36 as a brownish solid: m/z = 315 (M+H)+. Sodium hydride (1.05 eq) was slowly added at 0°C to a solution of iV-methyltrifluoro- acetamide (25 g) in DMF (140 mL). The mixture was stirred for Ih at room temperature under nitrogen. Then, a solution of bromohexene (32,1 g) in DMF (25 mL) was added dropwise and the mixture was heated to 70°C for 12 hours. The reaction mixture was poured on water (200 mL) and extracted with ether (4 x 50 mL), dried (MgSO4), filtered and evaporated to give 35 g of the target product 37 as a yellowish oil which was used without further purification in the next step. A solution of potassium hydroxide (187.7 g) in water (130 mL) was added dropwise to a solution of 37 (35 g) in methanol (200 mL). The mixture was stirred at room temperature for 12 hours. Then, the reaction mixture was poured on water (100 mL) and extracted with ether (4 x 50 mL), dried (MgSO4), filtered and the ether was distilled under atmospheric pressure. The resulting oil was purified by distillation under vacuum (13 mm Hg pressure, 50°C) to give 7,4 g (34 %) of the title product 38 as a colourless oil: 1H-NMR (CDCl3): δ 5.8 (m, IH), 5 (ddd, J= 17.2 Hz, 3.5 Hz, 1.8 Hz, IH), 4.95 (m, IH), 2.5 (t, J= 7.0 Hz, 2H), 2.43 (s, 3H), 2.08 (q, J= 7.0 Hz, 2H), 1.4 (m, 4H), 1.3 (br s, IH). 3-Oxo-2-oxa-bicyclo[2.2.1]heptane-5-carboxylic acid 39 (500 mg, 3.2 mmol) in 4 mlDMF was added at 0°C to HATU (1.34 g, 3.52 mmol) and iV-methylhex-5- enylamine (435 mg, 3.84 mmol) in DMF (3 mL), followed by DIPEA. After stirring for 40 min at 0°C, the mixture was stirred at room temperature for 5 h. Then, the solvent was evaporated, the residue dissolved in EtOAc (70 mL) and washed with saturated NaHCO3 (10 mL). The aqueous layer was extracted with EtOAc (2 x 25 mL). The organic phases were combined, washed with saturated NaCl (20 mL), dried (Na2SO4), and evaporated. Purification by flash chromatography (EtOAc/petroleum ether, 2:1) afforded 550 mg (68%) of the target product 40 as a colorless oil: m/z = 252 (M+H)+. A solution of LiOH (105 mg in 4 mlof water) was added at 0°C to the lactone amide 40. After Ih, the conversion was completed (HPLC). The mixture was acidified to pH 2 – 3 with IN HCl, extracted with AcOEt, dried (MgSO4), evaporated, co-evaporated with toluene several times, and dried under high vacuum overnight to give 520 mg (88%) of the target product 41: m/z = 270 (M+H)+. 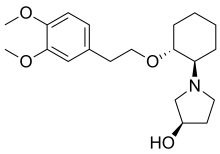 The l-(amino)-2-(vinyl)cyclopropanecarboxylic acid ethyl ester hydrochloride 42 (4.92 g, 31.7 mmol) and HATU (12.6 g, 33.2 mmol) were added to 41 (8.14 g, 30.2 mmol). The mixture was cooled in an ice bath under argon, and then DMF (100 mL) and DIPEA (12.5 mL, 11.5 mmol) were successively added. After 30 min at 0°C, the solution was stirred at room temperature for an additional 3 h. Then, the reaction mixture was partitioned between EtOAc and water, washed successively with 0.5 N HCl (20 mL) and saturated NaCl (2 x 20 mL), and dried (Na2SO4). Purification by flash chromatography (AcOEt/CH2Cl2/Petroleum ether, 1:1:1) afforded 7.41 g (60%) of the target product 43 as a colorless oil: m/z = 407 (M+H)+. DIAD (1.02 mL, 5.17 mmol) was added at -15°C under nitrogen atmosphere to a solution of 43 (1.5 g, 3.69 mmol), quinoline 36 (1.39 g, 4.43 mmol) and triphenyl- phosphine (1.26 g, 4.80 mmol) in dry THF (40 mL). After 4.5 h, at -15°C, the reaction mixture was partitioned between ice-cold water and AcOEt, dried (Na2SO4) and evaporated. The crude material was purified by flash column chromatography (gradient of petroleum AcOEt/CH2Cl2, 1 :9 to 2:8) to give 1.45 g (56 %) of the target product 44: m/z = 703 (M+H)+. A solution of 44 (1.07 g, 1.524 mmol) and Hoveyda-Grubbs 1st generation catalyst (33 mg, 0.03 eq) in dried and degassed 1,2-dichloroethane (900 mL) was heated at 75°C under nitrogen for 12 h. Then, the solvent was evaporated and the residue purified by silica gel chromatography (25% EtOAc in CH2Cl2). 620 mg (60%) of pure macrocycle 45 were obtained, m/z = 674 (M+H)+. 1H NMR (CDCl3): 1.18-1.39 (m, 12H), 1.59 (m, IH), 1.70-2.08 (m, 5H), 2.28 (m, IH), 2.38 (m, IH), 2.62 (m, 2H), 2.68 (s, 3H), 2.83 (m, IH), 3.06 (s, 3H), 3.19 (sept, J= 6.7 Hz, IH), 3.36 (m, IH), 3.83 (m, IH), 3.97 (s, 3H), 4.09 (m, 2H), 4.65 (td, J= 4 Hz, 14 Hz, IH), 5.19 (dd, J= 4 Hz, 10 Hz, IH), 5.31 (m, IH), 5.65 (td, J= 4 Hz, 8 Hz, IH), 7.00 (s, IH), 7.18 (s, IH), 7.46 (d, J= 9 Hz, IH), 7.48 (s, IH), 8.03 (d, J= 9 Hz, IH). A solution of lithium hydroxide (1.65 g, 38.53 mmol) in water (15 mL) was added to a stirred solution of ester 45 (620 mg, 0.920 mmol) in THF (30 mL) and MeOH (20 mL). After 16 h at room temperature, the reaction mixture was quenched with NH4Cl sat., concentrated under reduced pressure, acidified to pH 3 with HCl IN and extracted with CH2Cl2, dried (MgSO4) and evaporated to give 560 mg (88%) of carboxylic acid 46. m/z = 647 (M+H)+. 1H NMR (CDCl3): 1.11-1.40 (m, 8H), 1.42-1.57 (m, 2H), 1.74 (m, 2H), 1.88-2.00 (m, 2H), 2.13 (m, IH), 2.28 (m, IH), 2.40 (m, IH), 2.59 (m, 2H), 2.67 (s, 3H), 2.81 (m, IH), 2.97 (s, 3H), 3.19 (m, IH), 3.31 (m, IH), 3.71 (m, IH), 3.96 (s, 3H), 4.56 (dt, J= 4 Hz, 12 Hz, IH), 5.23 (m, 2H), 5.66 (m, IH), 7.01 (s, IH), 7.10 (s, IH), 7.22 (d, J= 10 Hz, IH), 7.45 (s, IH), 8.00 (d, J= 10 Hz, IH). A solution of 17-[2-(4-isopropylthiazole-2-yl)-7-methoxy-8-methylquinolin-4-yloxy]- 13-methyl-2, 14-dioxo-3, 13-diazatricyclo[l 3.3.0.04,6]octadec-7-ene-4-carboxylic acid 46 (560mg, 0.867 mmol) prepared according to Example 4, and carbonyldiimidazole (308 mg, 1.90 mmol) in dry THF (10 mL) was stirred at reflux under nitrogen for 2h. The reaction mixture was cooled to room temperature and cyclopropylsulfonamide (400 mg, 3.301 mmol) and DBU (286 mg, 1.881 mmol) were added. This solution was heated at 50°C for 15 h. Then, the reaction mixture was cooled down at room temperature and concentrated under reduced pressure. The residue was partitioned between CH2CI2 and HCl 1 N, the organic layer was washed with brine, dried (MgSO4) and evaporated. Purification by flash chromatography (gradient of EtOAc (0 to 25%) in CH2CI2) afforded 314 mg of an off-white solid which was further washed with water, then isopropylether, and dried in the vacuum oven to deliver 282 mg (40%) of the pure title product 47 SIMEPREVIR as a white powder: m/z = 750 (M+H)+. 1H NMR (CDCl3): 0.99-1.52 (m, 14H), 1.64-2.05 (m, 4H), 2.77 (m, IH), 2.41 (m, 2H), 2.59 (m, 2H), 2.69 (s, 3H), 2.92 (m, 2H), 3.04 (s, 3H), 3.19 (m, IH), 3.40 (m, 2H), 3.98 (s, 3H), 4.60 (t, J= 13 Hz, IH), 5.04 (t, J= 11 Hz, IH), 5.37 (m, IH), 5.66 (m, IH), 6.21 (s, IH), 7.02 (s, IH), 7.22 (d, J= 10 Hz, IH), 7.45 (s, IH), 7.99 (d, J= 10 Hz, IH), 10.82 (broad s, IH). Results from a phase IIa study evaluating Simeprevir and Sofosbuvir in prior null responder Hepatitis C patients have been presented at CROI. 6 March 2013. The U.S. Food and Drug Administration said on Friday it has expanded the approved use of the cancer drug Nexavar to include late-stage differentiated thyroid cancer. Differentiated thyroid cancer is the most common type of thyroid cancer, the FDA said. The National Cancer Institute estimates that 60,220 people in the United States will be diagnosed with it and 1,850 will die from the disease in 2013. The drug, made by Germany’s Bayer AG and Onyx Pharmaceuticals, is already approved to treat advanced kidney cancer and liver cancer that cannot be surgically removed. Onyx was acquired by Amgen Inc earlier this year. Elvitegravir (EVG, formerly GS-9137) is a drug used for the treatment of HIV infection. It acts as an integrase inhibitor. It was developed by the pharmaceutical company Gilead Sciences, which licensed EVG from Japan Tobacco in March 2008. The drug gained approval by U.S. Food and Drug Administration on August 27, 2012 for use in adult patients starting HIV treatment for the first time as part of the fixed dose combination known as Stribild. According to the results of the phase II clinical trial, patients taking once-daily elvitegravir boosted by ritonavir had greater reductions in viral load after 24 weeks compared to individuals randomized to receive a ritonavir-boosted protease inhibitor. Human immunodeficiency virus type 1 (HIV-1) is the causative agent of acquired immunodeficiency disease syndrome (AIDS). After over 26 years of efforts, there is still not a therapeutic cure or an effective vaccine against HIV/AIDS. The clinical management of HIV-1 infected people largely relies on antiretroviral therapy (ART). Although highly active antiretroviral therapy (HAART) has provided an effective way to treat AIDS patients, the huge burden of ART in developing countries, together with the increasing incidence of drug resistant viruses among treated people, calls for continuous efforts for the development of anti-HIV-1 drugs. Currently, four classes of over 30 licensed antiretrovirals (ARVs) and combination regimens of these ARVs are in use clinically including: reverse transcriptase inhibitors (RTIs) (e.g. nucleoside reverse transcriptase inhibitors, NRTIs; and non-nucleoside reverse transcriptase inhibitors, NNRTIs), protease inhibitors (PIs), integrase inhibitors and entry inhibitors (e.g. fusion inhibitors and CCR5 antagonists). Shimura K, Kodama E, Sakagami Y, et al. (2007). 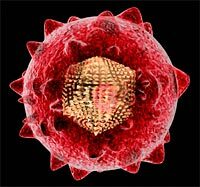 “Broad Anti-Retroviral Activity and Resistance Profile of a Novel Human Immunodeficiency Virus Integrase Inhibitor, Elvitegravir (JTK-303/GS-9137)”. J Virol 82 (2): 764. doi:10.1128/JVI.01534-07. PMC 2224569. PMID 17977962. Stellbrink HJ (2007). “Antiviral drugs in the treatment of AIDS: what is in the pipeline ?”. Eur. J. Med. Res. 12 (9): 483–95. PMID 17933730. Thaczuk, Derek and Carter, Michael. ICAAC: Best response to elvitegravir seen when used with T-20 and other active agents Aidsmap.com. 19 Sept. 2007. 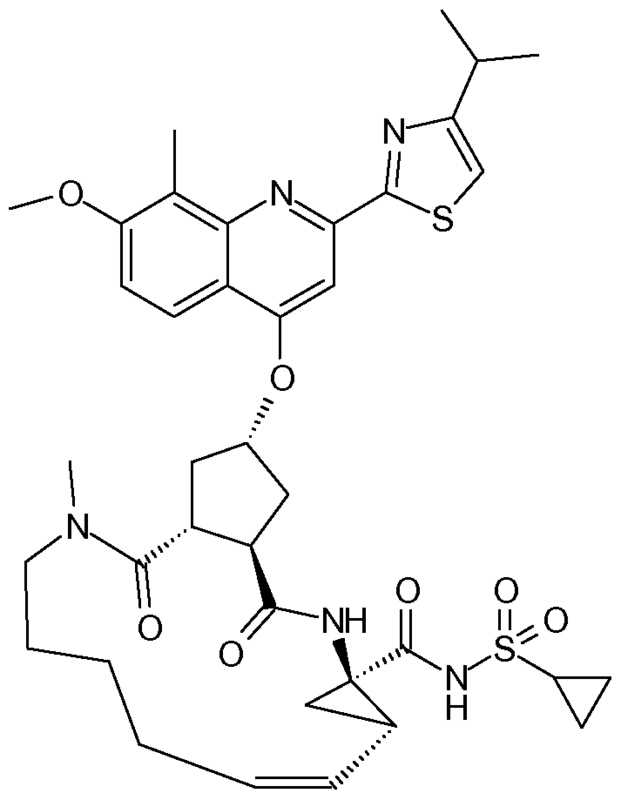 WO 2000040561 , WO 2000040563 and WO 2001098275 disclose 4-oxo-1 , 4-dihydro-3- quinoline which is useful as antiviral agents. 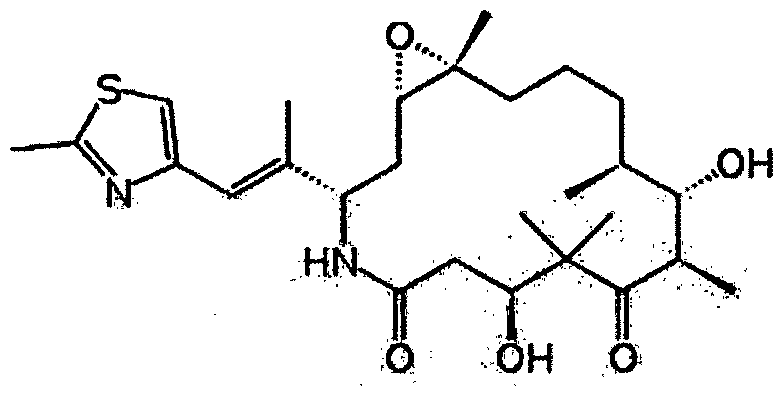 WO2004046115 provides certain 4- oxoquinoline compounds that are useful as HIV Integrase inhibitors. Elvitegravir Form ] Elvitegravir (residue) US 7635704 patent discloses certain specific crystalline forms of elvitegravir. The specific crystalline forms are reported to have superior physical and chemical stability compared to other physical forms of the compound. Further, process for the preparation of elvitegravir also disclosed and is depicted below in the Scheme B. The given processes involve the isolation of the intermediates at almost all the stages. Elvitegravir WO 2007102499 discloses a compound which is useful as an intermediate for the synthesis of an anti-HIV agent having an integrase-inhibiting activity; a process for production of the compound; and a process for production of an anti-HIV agent using the intermediate. WO 2009036161 also discloses synthetic processes and synthetic intermediates that can be used to prepare 4-oxoquinolone compounds having useful integrase inhibiting properties. 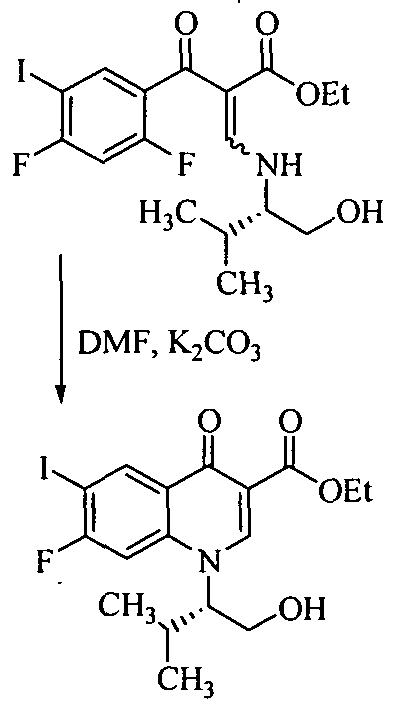 The said processes are tedious in making and the purity of the final compound is affected because of the number of steps, their isolation, purification etc., thus, there is a need for new synthetic methods for producing elvitegravir which process is cost effective, easy to practice, increase the yield and purity of the final compound, or that eliminate the use of toxic or costly reagents. US Patent No 7176220 discloses Elvitegravir, solvate, stereoisomer, tautomer, pharmaceutically acceptable salt thereof or pharmaceutical composition containing them and ■ their method of treatment. US Patent No 7635704 discloses Elvitegravir Form II, Form III and processes for their preparation. The process for the preparation of Form Il disclosed in the said patent is mainly by three methods – a) dissolution of Elvitegravir followed by seeding with Form II, b) recrystallisation of Elvitegravir, and c) anti-solvent method. The process for the preparation of Form III in the said patent is mainly by three methods – a) dissolution of Form Il in isobutyl acetate by heating followed by cooling the reaction mass, b) dissolution of Form Il in isobutyl acetate by heating followed by seeding with Form III, and c) dissolving Form Il in 2-propanol followed by seeding with Form III. Amorphous materials are becoming more prevalent in the pharmaceutical industry. In order to overcome the solubility and potential bioavailability issues, amorphous solid forms are becoming front-runners. Of special importance is the distinction between amorphous and crystalline forms, as they have differing implications on drug substance stability, as well as drug product stability and efficacy. An estimated 50% of all drug molecules used in medicinal therapy are administered as salts. A drug substance often has certain suboptimal physicochemical or biopharmaceutical properties that can be overcome by pairing a basic or acidic drug molecule with a counter- ion to create a salt version of the drug. 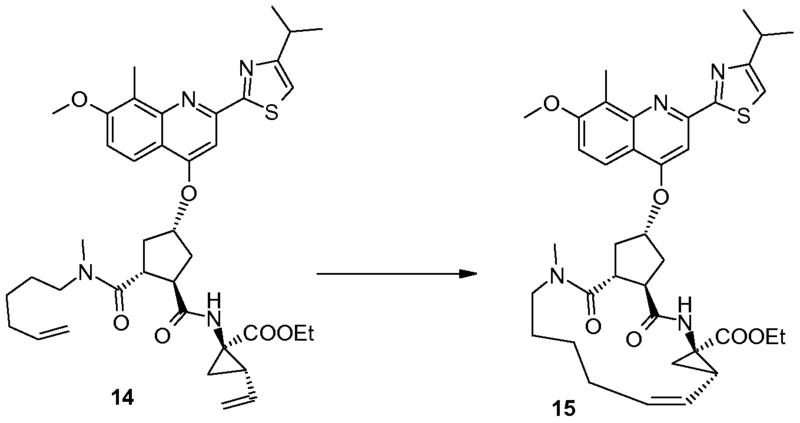 The process is a simple way to modify the properties of a drug with ionizable functional groups to overcome undesirable features of the parent drug. Salt forms of drugs have a large effect on the drugs’ quality, safety, and performance. The properties of salt-forming species significantly affect the pharmaceutical properties of a drug and can greatly benefit chemists and formulators in various facets of drug discovery and development. After isolation of the elvitegravir from the mixture of ethyl acetate-hexane, solvent from the filtrate was removed under reduced pressure. The resultant residue purified by column chromatography using a mixture of ethyl acetate-hexane (gradient, 20-80% EtOAc in hexane) as an eluent. Upon concentration of the required fractions, a thick solid was obtained which was further purified on slurry washing with ethyl acetate to get pure elvitegravir dimer impurity (13). The 1H-NMR, 13C-NMR and mass spectral data complies with proposed structure. 7.45-7.48 (m, 1 H, 2), 7.49, 7.56 (s, 2H, 15 & 15′), 7.99, 8.02 (s, 2H, 9 & 9′), 8.89, 9.01 (s, 2H, 13 & 13′), 15.30, 15.33 (s, 2H, COOH’ & COOH”). 160.17 (16’C), 162.04 (16C), 166.00, 166.14 (22C, 22’C), 176.17, 176.22 (11C, 111C). DIP MS: m/z (%)- 863 [M+H]+, 885 [M+Na]+. VANCOUVER, Nov. 21, 2013 /PRNewswire/ – Cardiome Pharma Corp. (NASDAQ: CRME / TSX: COM) today announced that a publication titled, Pharmacological Cardioversion of Atrial Fibrillation with Vernakalant: Evidence in Support of the ESC Guidelines, was published in Europace, the official Journal of the European Heart Rhythm Association, and was made available in the advanced online article access section. The authors conclude that BRINAVESS is an efficacious and rapid acting pharmacological cardioversion agent, for recent-onset atrial fibrillation (AF,) that can be used first line in patients with little or no underlying cardiovascular disease and in patients with moderate disease, such as stable coronary and hypertensive heart disease. Vernakalant (INN; codenamed RSD1235, proposed tradenames Kynapid and Brinavess) is an investigational drug under regulatory review for the acute conversion of atrial fibrillation. It was initially developed by Cardiome Pharma, and the intravenous formulation has been bought for further development by Merck in April 2009. In September 2012, Merck terminated its agreements with Cardiom and has consequently returned all rights of the drug back to Cardiom. On 11 December 2007, the Cardiovascular and Renal Drugs Advisory Committee of the USFood and Drug Administration (FDA) voted to recommend the approval of vernakalant,but in August 2008 the FDA judged that additional information was necessary for approval. The drug was approved in Europe on 1 September 2010. An oral formulation underwent Phase II clinical trials between 2005 and 2008. Like other class III antiarrhythmics, vernakalant blocks atrial potassium channels, thereby prolonging repolarization. It differs from typical class III agents by blocking a certain type of potassium channel, the cardiac transient outward potassium current, with increased potency as the heart rate increases. This means that it is more effective at high heart rates, while other class III agents tend to lose effectiveness under these circumstances. It also slightly blocks the hERG potassium channel, leading to a prolonged QT interval. This may theoretically increase the risk of ventricular tachycardia, though this does not seem to be clinically relevant. The drug also blocks atrial sodium channels. “Merck and Cardiome Pharma Sign License Agreement for Vernakalant, an Investigational Drug for Treatment of Atrial Fibrillation”. FierceBiotech. 9 April 2009. Retrieved 12 October 2010. “FDA Advisory Committee Recommends Approval of Kynapid for Acute Atrial Fibrillation”. Drugs.com. Retrieved 2008-03-15. “BRINAVESS (vernakalant) for Infusion Approved in the European Union for Rapid Conversion of Recent Onset Atrial Fibrillation” (Press release). Merck & Co., Inc. 1 September 2010. Retrieved 28 September 2010. 7.7, 3.5, 1H), 2.96-2.75 (m, 5H), 2.64 (dd, J= 10.0, 5.0, 1H), 2.49-2.37 (m, 2H), 2.05-1.98 (m, 2H), 1.84 (m, 1H), 1.69-1.62 (m, 3H), 1.35-1.19 (m, 4H). Arrhythmias are abnormal rhythms of the heart. The term “arrhythmia” refers to a deviation from the normal sequence of initiation and conduction of electrical impulses that cause the heart to beat. Arrhythmias may occur in the atria or the ventricles. Atrial arrhythmias are widespread and relatively benign, although they place the subject at a higher risk of stroke and heart failure. Ventricular arrhythmias are typically less common, but very often fatal. Arrhythmia is a variation from the normal rhythm of the heart beat and generally represents the end product of abnormal ion-channel structure, number or function. Both atrial arrhythmias and ventricular arrhythmias are known. The major cause of fatalities due to cardiac arrhythmias is the subtype of ventricular arrhythmias known as ventricular fibrillation (VF). Conservative estimates indicate that, in the U.S. alone, each year over one million Americans will have a new or recurrent coronary attack (defined as myocardial infarction or fatal coronary heart disease). About 650,000 of these will be first heart attacks and 450,000 will be recurrent attacks. About one-third of the people experiencing these attacks will die of them. At least 250,000 people a year die of coronary heart disease within 1 hour of the onset of symptoms and before they reach a hospital. These are sudden deaths caused by cardiac arrest, usually resulting from ventricular fibrillation. Atrial fibrillation (AF) is the most common arrhythmia seen in clinical practice and is a cause of morbidity in many individuals (Pritchett E.L., N. Engl. J. Med. 327(14):1031 Oct. 1, 1992, discussion 1031-2; Kannel and Wolf, Am. Heart J. 123(l):264-7 Jan. 1992). Its prevalence is likely to increase as the population ages and it is estimated that 3-5% of patients over the age of 60 years have AF (Kannel W.B., Abbot R.D., Savage D.D., McNamara P.M., N. Engl. J. Med. 306(17): 1018-22, 1982; Wolf P.A., Abbot R.D., Kannel W.B. Stroke. 22(8):983-8, 1991). While AF is rarely fatal, it can impair cardiac function and is a major cause of stroke (Hinton R.C., Kistler J.P., Fallon J.T., Friedlich A.L., Fisher CM., American Journal of Cardiology 40(4):509-13, 1977; Wolf P.A., Abbot R.D., Kannel W.B., Archives of Internal Medicine 147(9): 1561 -4, 1987; Wolf P. A., Abbot R.D., Kannel W.B. Stroke. 22(8):983-8, 1991; Cabin H.S., Clubb K.S., Hall C, Perlmutter R.A., Feinstein A.R., American Journal of Cardiology 65(16): 1112-6, 1990). 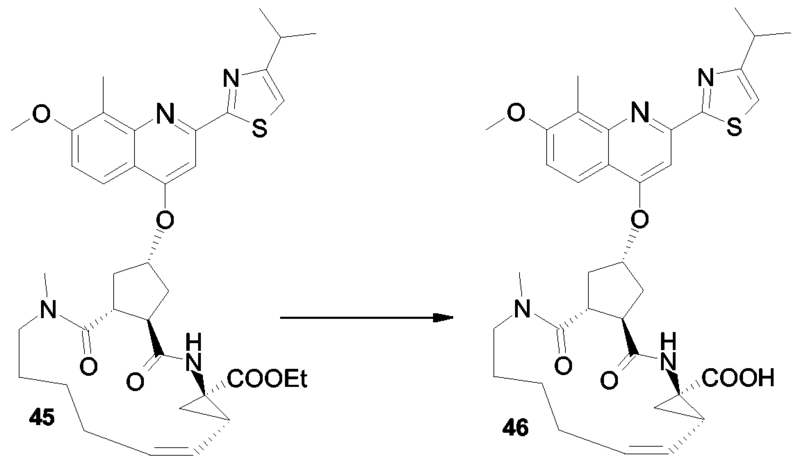 WO95/08544 discloses a class of aminocyclohexylester compounds as useful in the treatment of arrhythmias. 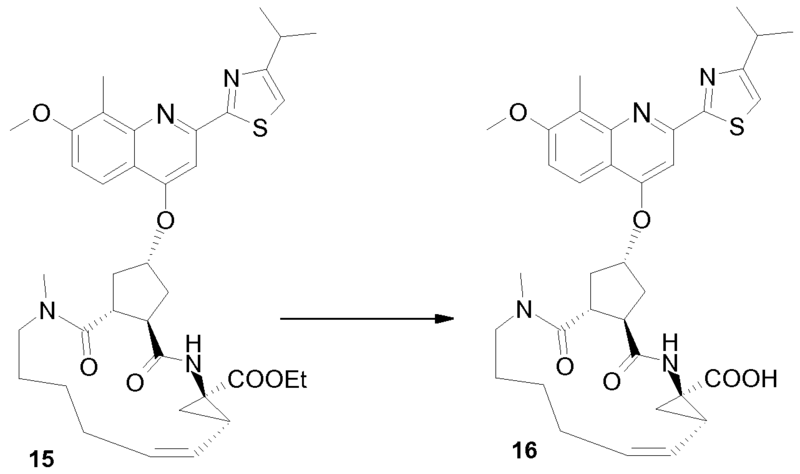 WO93/ 19056 discloses a class of aminocyclohexylamides as useful in the treatment of arrhythmia and in the inducement of local anaesthesia. WO99/50225 discloses a class of aminocyclohexylether compounds as useful in the treatment of arrhythmias. Antiarrhythmic agents have been developed to prevent or alleviate cardiac arrhythmia. For example, Class I antiarrhythmic compounds have been used to treat supraventricular arrhythmias and ventricular arrhythmias. Treatment of ventricular arrhythmia is very important since such an arrhythmia can be fatal. Serious ventricular arrhythmias (ventricular tachycardia and ventricular fibrillation) occur most often in the presence of myocardial ischemia and/or infarction. Ventricular fibrillation often occurs in the setting of acute myocardial ischemia, before infarction fully develops. At present, there is no satisfactory pharmacotherapy for the treatment and/or prevention of ventricular fibrillation during acute ischemia. In fact, many Class I antiarrhythmic compounds may actually increase mortality in patients who have had a myocardial infarction. Class la, Ic and HI antiarrhythmic drugs have been used to convert recent onset AF to sinus rhythm and prevent recurrence of the arrhythmia (Fuch and Podrid, 1992; Nattel S., Hadjis T., Talajic M., Drugs 48(3):345-7l, 1994). However, drug therapy is often limited by adverse effects, including the possibility of increased mortality, and inadequate efficacy (Feld G.K., Circulation. <°3(<5):2248-50, 1990; Coplen S.E., Antman E.M., Berlin J.A., Hewitt P., Chalmers T.C., Circulation 1991; S3(2):714 and Circulation 82(4):1106-16, 1990; Flaker G.C., Blackshear J.L., McBride R., Kronmal R.A., Halperin J.L., Hart R.G., Journal of the American College of Cardiology 20(3):527-32, 1992; CAST, N. Engl. J. Med. 321:406, 1989; Nattel S., Cardiovascular Research. 37(3):567 -77, 1998). Conversion rates for Class I antiarrhythmics range between 50-90% (Nattel S., Hadjis T., Talajic M., Drugs 48(3)345-71, 1994; Steinbeck G., Remp T., Hoffmann E., Journal of Cardiovascular Electrophysiology. 9(8 Suppl):S 104-8, 1998). Class ILT antiarrhythmics appear to be more effective for terminating atrial flutter than for AF and are generally regarded as less effective than Class I drugs for terminating of AF (Nattel S., Hadjis T., Talajic M., Drugs. 48(3):345-71, 1994; Capucci A., Aschieri D., Villani G.Q., Drugs & Aging 13(l):5l- 70, 1998). Examples of such drugs include ibutilide, dofetilide and sotalol. Conversion rates for these drugs range between 30-50% for recent onset AF (Capucci A., Aschieri D., Nillani G.Q., Drugs & Aging J3(l):5l-70, 1998), and they are also associated with a risk of the induction of Torsades de Pointes ventricular tachyarrhythmias. For ibutilide, the risk of ventricular proarrhythmia is estimated at ~4.4%, with ~1.7% of patients requiring cardioversion for refractory ventricular arrhythmias (Kowey P.R., NanderLugt J.T., Luderer J.R., American Journal of Cardiology 78(8A):46-52, 1996). Such events are particularly tragic in the case of AF as this arrhythmia is rarely a fatal in and of itself. Atrial fibrillation is the most common arrhythmia encountered in clinical practice. It has been estimated that 2.2 million individuals in the United States have paroxysmal or persistent atrial fibrillation. The prevalence of atrial fibrillation is estimated at 0.4% of the general population, and increases with age. Atrial fibrillation is usually associated with age and general physical condition, rather than with a specific cardiac event, as is often the case with ventricular arrhythmia. While not directly life threatening, atrial arrhythmias can cause discomfort and can lead to stroke or congestive heart failure, and increase overall morbidity. There are two general therapeutic strategies used in treating subjects with atrial fibrillation. One strategy is to allow the atrial fibrillation to continue and to control the ventricular response rate by slowing the conduction through the atrioventricular (AV) node with digoxin, calcium channel blockers or beta-blockers; this is referred to as rate control. The other strategy, known as rhythm control, seeks to convert the atrial fibrillation and then maintain normal sinus rhythm, thus attempting to avoid the morbidity associated with chronic atrial fibrillation. The main disadvantage of the rhythm control strategy is related to the toxicities and proarrhythmic potential of the anti-arrhythmic drugs used in this strategy. Most drugs currently used to prevent atrial or ventricular arrhythmias have effects on the entire heart muscle, including both healthy and damaged tissue. These drugs, which globally block ion channels in the heart, have long been associated with life-threatening ventricular arrhythmia, leading to increased, rather than decreased, mortality in broad subject populations. There is therefore a long recognized need for antiarrhythmic drugs that are more selective for the tissue responsible for the arrhythmia, leaving the rest of the heart to function normally, less likely to cause ventricular arrhythmias. 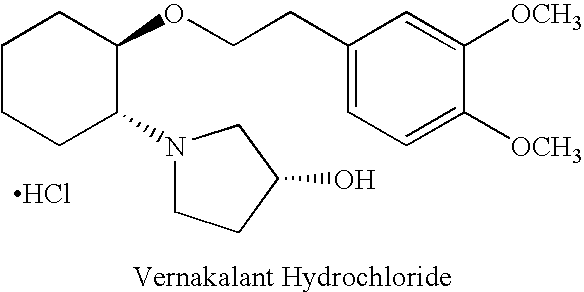 Vernakalant hydrochloride may also be referred to as “vernakalant” herein. Vernakalant hydrochloride modifies atrial electrical activity through a combination of concentration-, voltage- and frequency-dependent blockade of sodium channels and blockade of potassium channels, including, e.g., the ultra-rapidly activating (lKur) and transient outward (lto) channels. These combined effects prolong atrial refractoriness and rate-dependently slow atrial conduction. This unique profile provides an effective anti-fibrillatory approach suitable for conversion of atrial fibrillation and the prevention of atrial fibrillation. Daiichi Sankyo will file edoxaban on both sides of the Atlantic shortly after the bloodthinner proved as effective and safer than warfarin in a Phase III trial of patients with atrial fibrillation. Edoxaban (INN, codenamed DU-176b, trade name Lixiana) is an anticoagulant drug which acts as a direct factor Xa inhibitor. It is being developed by Daiichi Sankyo. It was approved in July 2011 in Japan for prevention of venous thromboembolisms (VTE) following lower-limb orthopedic surgery. In animal studies, edoxaban is potent, selective for factor Xa and has good oral bioavailability. Tmax (1–2 h) after dosing and sustained for up to 24 h post-dose. Several Phase II clinical trials have been conducted, for example for thromboprophylaxis after total hip replacement (phase III early results compare well to enoxaparin), and for stroke prevention in patients with atrial fibrillation.Those papers follow similar recent major trials showing similar results for the other new factor Xa inhibitors, rivaroxaban and apixaban. A large phase III trial showed that edoxaban was non inferior to warfarin in preventing recurrent venous thromboembolic events with fewer episodes of major bleeding. “First market approval in Japan for LIXIANA (Edoxaban)”. Press Release. Daiichi Sankyo Europe GmbH. 2011-04-22. Furugohri T, Isobe K, Honda Y, Kamisato-Matsumoto C, Sugiyama N, Nagahara T, Morishima Y, Shibano T (September 2008). 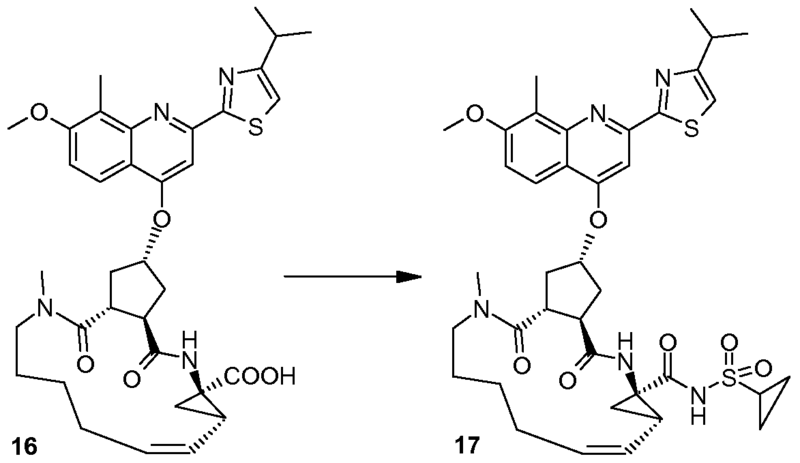 “DU-176b, a potent and orally active factor Xa inhibitor: in vitro and in vivo pharmacological profiles”. J. Thromb. Haemost. 6 (9): 1542–9. doi:10.1111/j.1538-7836.2008.03064.x. PMID 18624979. “Phase III Trial Finds Edoxaban Outclasses Enoxaparin in Preventing Venous Thromboembolic Events”. 8 Dec 2010. Weitz JI, Connolly SJ, Patel I, Salazar D, Rohatagi S, Mendell J, Kastrissios H, Jin J, Kunitada S (September 2010). “Randomised, parallel-group, multicentre, multinational phase 2 study comparing edoxaban, an oral factor Xa inhibitor, with warfarin for stroke prevention in patients with atrial fibrillation”. Thromb. Haemost. 104 (3): 633–41. doi:10.1160/TH10-01-0066. “Edoxaban versus Warfarin for the Treatment of Symptomatic Venous Thromboembolism”. N. Engl. J. Med. August 2013. doi:10.1056/NEJMoa1306638. 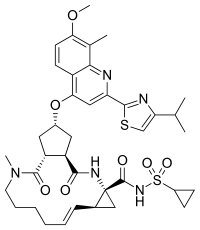 PMID 23991658.
is known as a compound that exhibits an inhibitory effect on activated blood coagulation factor X (FXa), and is useful as a preventive and/or therapeutic drug for thrombotic diseases (Patent Literature 1 to 8). with p-toluenesulfonic acid or p-toluenesulfonic acid monohydrate, followed by crystallization from aqueous ethanol, is known as a method for obtaining compound A (Patent Literature 1 to 8). These literature documents do not make any mention about adding p-toluenesulfonic acid or p-toluenesulfonic acid monohydrate in a stepwise manner in the step of obtaining compound A from compound B.
Edoxaban is reported to be a member of the so-called “Xaban-group” and as such to be a low molecular inhibitor of the enzyme factor Xa, participating in the blood coagulation system. Therefore, edoxaban is classified as an antithrombotic drug and its possible medical indications are reported to be treatment of thrombosis and thrombosis prophylaxis after orthopaedic operations, such as total hip replacement, as well as for stroke prevention in patients with atrial fibrillation, the prophylaxis of the acute coronary syndrome and the prophylaxis after thrombosis and pulmonary embolism. formula ( 1 ) While Edoxaban is reported to be soluble in strongly acidic aqueous solutions, its solubility is considered to be very low in neutral or alkaline aqueous media. EP 2 140 867 A 1 claims an edoxaban-containing pharmaceutical composition comprising a water-swelling additive and/or a sugar alcohol. Further, it is alleged that compositions comprising lactose or cornstarch do not have good dissolution properties. The claimed pharmaceutical compositions in EP 2 140 867 Al are considered to show good dissolution properties in a neutral aqueous medium as well. Tablets comprising said composition were produced by wet granulation. However, it turned out that prior art pharmaceutical formulations comprising edoxaban being suitable for oral administration are still improvable with regards to dissolution rate and bioavailability. Further, stability and content uniformity of the known formulations could be improved. Further, due to the intolerance of many people to sugar alcohol(s), such as sorbitol, the use of sugar alcohol(s) should be avoided. 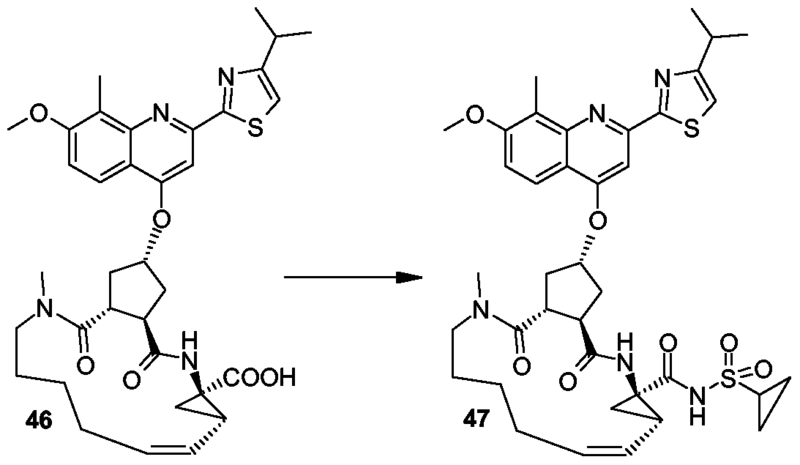 Ixabepilone (INN; also known as azaepothilone B, codenamed BMS-247550) is an epothilone B analog developed byBristol-Myers Squibb as a chemotherapeutic medication for cancer. It is produced by Sorangium cellulosum. It acts to stabilize microtubules. It is highly potent agent, capable of damaging cancer cells in very low concentrations, and retains activity in cases where tumor cells are insensitive to paclitaxel. On October 16, 2007, the U.S. Food and Drug Administration approved ixabepilone for the treatment of aggressive metastaticor locally advanced breast cancer no longer responding to currently available chemotherapies. In November 2008, the EMEAhas refused a marketing authorisation for Ixabepilone. Ixabepilone is administered through injection, and is marketed under the trade name Ixempra. Ixabepilone, in combination with capecitabine, has demonstrated effectiveness in the treatment of metastatic or locally advanced breast cancer in patients after failure of an anthracycline and a taxane. It has been investigated for use in treatment of non-Hodgkin’s lymphoma. 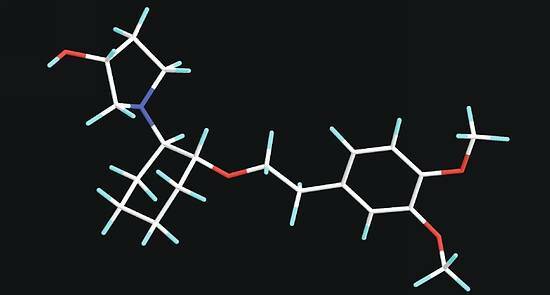 In pancreatic cancer phase two trial it showed some promising results (used alone). Combination therapy trials are ongoing. 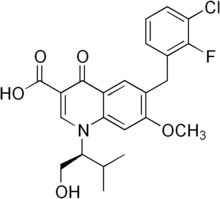 Ixabepilone is an anti cancer agent acting as a microtubule inhibitor, and which in particular are efficient in the treatment of cancer not reacting to other anti cancer agents, such as e.g. paclitaxel. Ixabepilone is marketed under the trade name Ixempra® and are approved for the treatment of aggressive metastatic or locally advanced breast cancer which not responding to the current prevailing chemotherapies. Epothilone B Ixabepilone as a compound is described in the USRE4191 1. 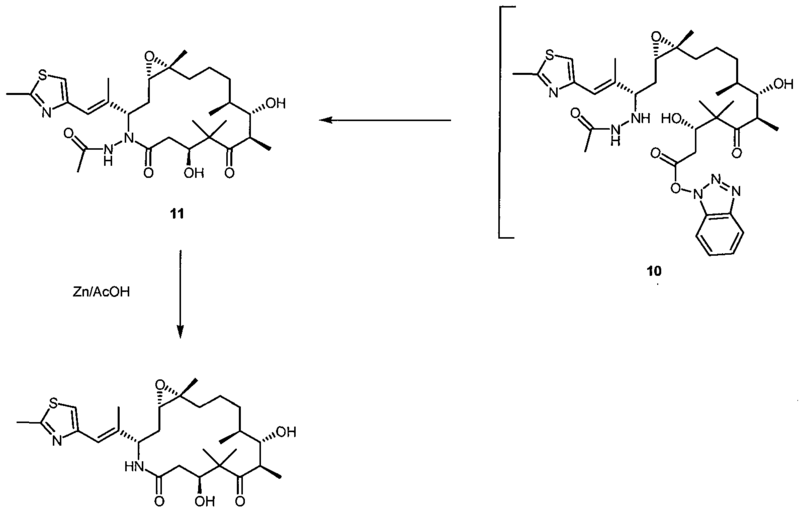 USRE4191 1 furthermore disclose a process for synthesizing Ixabepilone. The US 6,365,749 describes a process for making ixabepilone by reacting epothilone B with a palladium catalyst in the presence of a nucleophilic donor. The USRE39356 do also describe a process for making Ixabepilone by reacting epothilone B with an azide donor agent and a reducing agent in the presence of a phase transfer catalyst and a palladium catalyst. Ixabepilone is the treatment of metastatic and advanced breast cancer drugs.Ixabepilone as anticancer drugs alone or in combination with capecitabine (Capecitabine) in combination. October 16, 2007 approved for marketing by the FDA, trade name Ixempra, by the Bristol-Myers Squibb Company’s development. Ixabepilone is an anti-mitotic drugs that are inhibitors of tubulin, the mechanism and paclitaxel (Taxol) the same class of drugs. 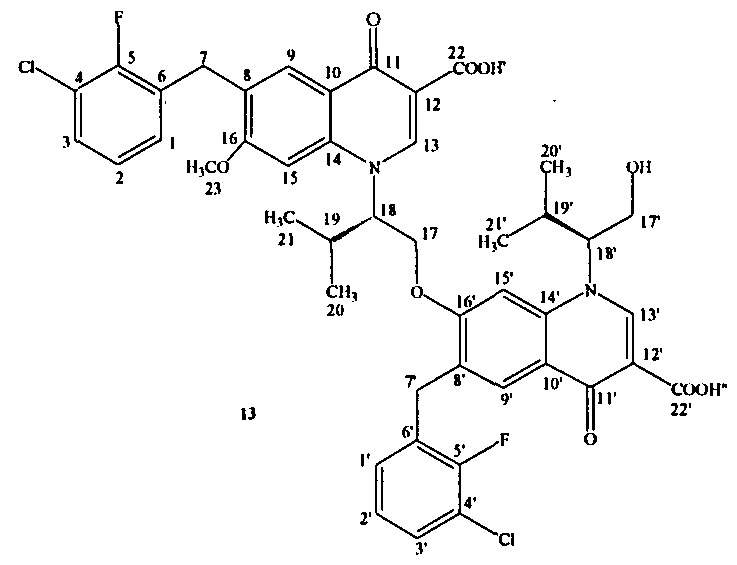 Epothilone (Epothilone) by colistin (myxobacterium) Sorangium cellulosum fermentation of several macrolide metabolites in general. Anticancer activity in vitro experiments, epothilone A and epothilone B showed good activity, even in the paclitaxel-resistant cells also showed good activity. But its activity in vivo experiments in general, this is probably due to the body of the ester hydrolases that macrolide ring opening induced inactivation. In a series of epothilone derivatives activity test, it was found with the lactam bond instead of the original product of ester bonds – ixabepilone anticancer activity can be well retained. Ixabepilone is epothilone B semi-synthetic derivatives. Epothilone B is a macrocyclic lactone, a hydroxyl moiety is allyl alcohol, the Pd catalyst can be obtained by ring-opening Pd complexes 1 , 1 received azide nucleophile attacking the anion generated with three azide product phosphorus reduction to give methyl amino acids 2 . 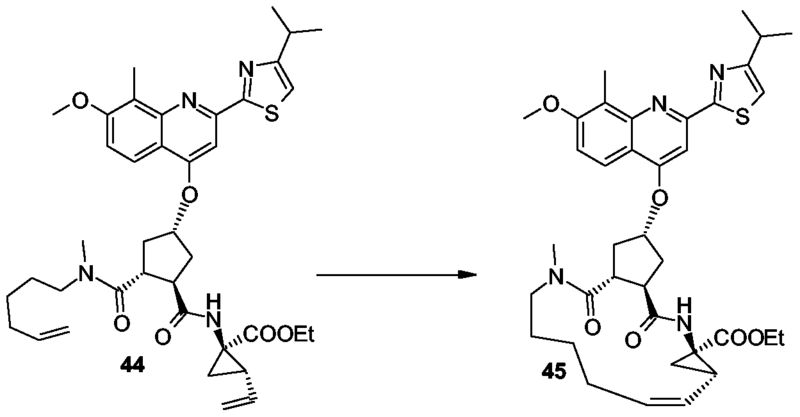 Here we must point out that the attack was completely azide stereoselectivity, which is determined by two consecutive trans-attack lead, Pd (0)-trans lactone generate offensive allyl Pd complexes, to accept anti-azide anion type attack, to maintain the configuration of the product obtained. Amino acids 2 HoBt and EDCI generated by an amide bond to get ixabepilone. IXEMPRA (ixabepilone) is a microtubule inhibitor belonging to a class of antineoplastic agents, the epothilones and their analogs. The epothilones are isolated from the myxobacterium Sorangium cellulosum. Ixabepilone is a semisynthetic analog of epothilone B, a 16-membered polyketide macrolide, with a chemically modified lactam substitution for the naturally existing lactone. IXEMPRA (ixabepilone) for injection is intended for intravenous infusion only after constitution with the supplied DILUENT and after further dilution with a specified infusion fluid . IXEMPRA (ixabepilone) for injection is supplied as a sterile, non-pyrogenic, single-use vial providing 15 mg or 45 mg ixabepilone as a lyophilized white powder. The DILUENT for IXEMPRA is a sterile, non-pyrogenic solution of 52.8% (w/v) purified polyoxyethylated castor oil and 39.8% (w/v) dehydrated alcohol, USP. The IXEMPRA (ixabepilone) for injection and the DILUENT for IXEMPRA are co-packaged and supplied as IXEMPRA Kit.